As a parent, you know the struggle to raise your child, and you know exactly how tough it is to travel around with them as you have to carry around several of their things with you. Hence, if you are parents to newborn twins, it is twice as hard and regular diaper bags won’t cut it for you. That’s why today, we will be reviewing three of the very best diaper bag for twins. A diaper bag is essential when you step out as it keeps all of the baby’s necessities organized. When it comes to a diaper bag for twins, it is far different than a regular diaper bag. It needs more room and has to be bigger overall. 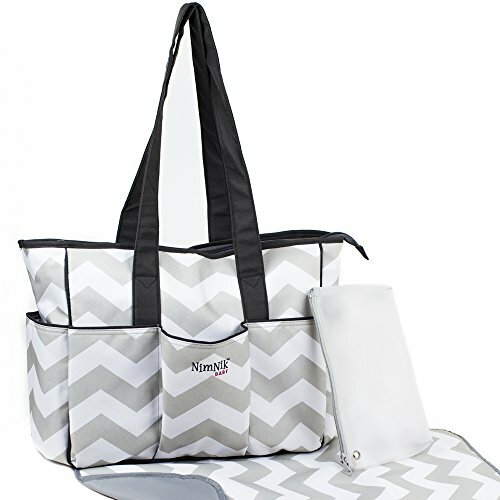 No parent wants a mess in their diaper bag especially when their child is crying. There are quite a few diaper bags in the market, but very few are actually designed wherein twins have been kept in mind. Keep reading this article as we are going to be reviewing three of the very best diaper bag for twins. If you need a high-quality product, then the 7Senses Diaper Bag for Boys and Girls is what you need. 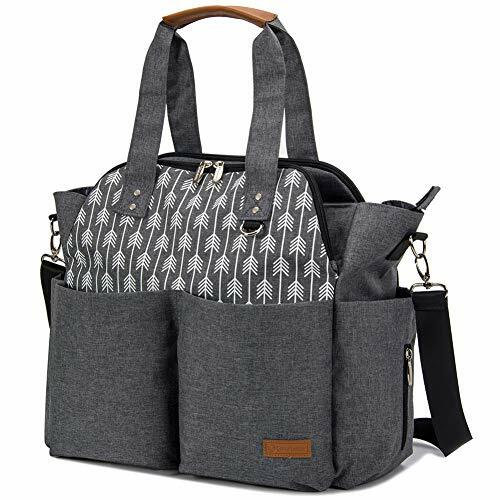 This stylish diaper bag comes in color gray and is made from a high-quality fabric along with brown leather accents. The zipper is highly durable and will last for long. This bag is big enough to fit your baby’s essentials and even yours, like phone or tablets or even laptops. The bag has a size dimension of 17 x 13 x 7 inches and weighs just around 2.6 lbs. All in all, this entire diaper bag has ten pockets. There is an allotted spot for every item to place in this bag so that everything remains organized. There is one main compartment that is equipped with a zipper, two additional big pockets with a magnetic closure pocket, five pockets inside the bag and one pocket that is insulated. On the outside, there are two side pockets as well. All these spaces ensure nothing will ever get mixed up in your bag. This product comes shipped with a padded diaper changing pad that you can use on the go. It also has stroller straps that will easily latch on to the stroller when you are tired of carrying the bag around. Not only does this bag have enough room for the twins’ things, but also this bag is very stylish and chic. The company has targeted both men and women to sell this bag too. It also makes a fabulous baby shower present. The stitching isn’t too strong. The Lekebaby Diaper Purse is a fantastic and durable diaper bag with a very interesting arrow-like design on the front of the bag. The bag is resistant to water and effortless to clean and is made from 100% polyester. The bag in itself weighs two pounds, and its dimensions are 16 x 6 x 14 inches. It comes in one, versatile color, which is dark gray. There are tons of pockets on this bag, which totals to about 17 pockets. Nine of them are on the outside while eight of them are on the inside. There are two thermal baby bottle holders inside of this bag. The bag’s main compartment has an installed zipper closure. When it comes to carrying this bag around, you either wear it as a purse or use the padded strap to carry it on the shoulder. What is better is that the strap will sit comfortably on your shoulder, and if you are tired of holding it altogether, just clip it on the stroller using its integral stroller clips. They also provide you with a diaper changing pad when you buy this product. The 17 pockets on this purse are brilliant to store everything in this bag. Great design and very sturdy. The arrow design is blue in real life rather than white, which is what it appears to be like in the pictures. The NimNik Baby Diaper Bag is great for parents who love trendy and stylish prints. Available in a chevron pattern with the colors light gray and white with a black handle, this stylish bag is very versatile. It can effortlessly transition from being a diaper bag to a shoulder bag or a nappy bag or even just a shopping bag. This bag will save you the stress of using multiple bags. This bag is made from high-quality 100%, non-odor polyester and is free from BPA, making it safe for you and your child. The zippers on this bag too are really durable and will last for a while. The dimensions of this bag are 16.5 x 15.5 x 5 inches. They also give you a complimentary wet bag and a diaper changing mat when you buy this product. Moreover, the bag has a wide opening with mesh pockets and also has a contrasting lining making it easy to see through everything in the bag. There is a ton of storage space on the inside as well as outside of the bag. All the pockets are designed to keep things in place and not become a mess in your bag. This bag will not tilt and fall at any point thanks to its double thick bottom. The chevron design in light gray and white is aesthetically pleasing. High-quality materials are used to make this bag. It has a wide opening to quickly access the items inside. Sometimes, this product tends to get shipped without the changing pad or the wet bag, and sometimes, even both. The three products mentioned above are some of the best diaper bag for twins that you can buy right away. If we were to recommend one, then it would be the Lekebaby Diaper Purse. Not only is this bag stylish looking, but it also comes with loads of storage space which is crucial if you have twins. What to Pack in Diaper Bag for Hospital Admission? 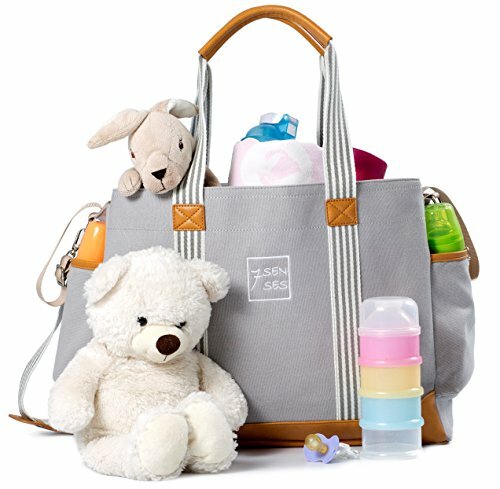 What Kind of Diaper Bag Should I Get? Some recommended products may use affiliate links. GreatLittleHuman.com is a participant in the Amazon Services LLC Associates Program, an affiliate advertising program designed to provide a means for sites to earn advertising fees by advertising and linking to Amazon.com. Amazon and the Amazon logo are trademarks of Amazon.com, Inc or its affiliates. Copyright © 2017. Great Little Human. All Rights Reserved.